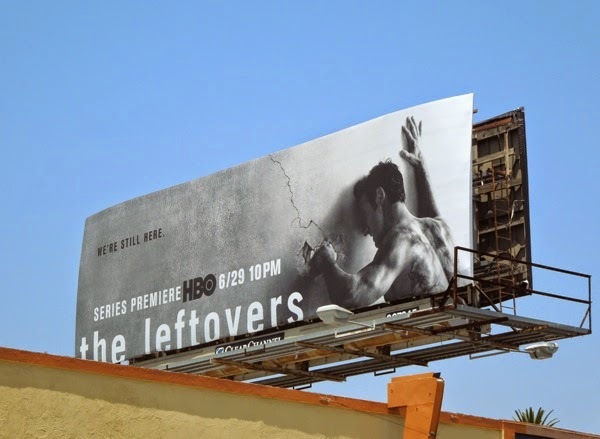 You know something is wrong by the nature of these frenetic looking ad creatives for HBO's new dramatic fantasy series, The Leftovers. 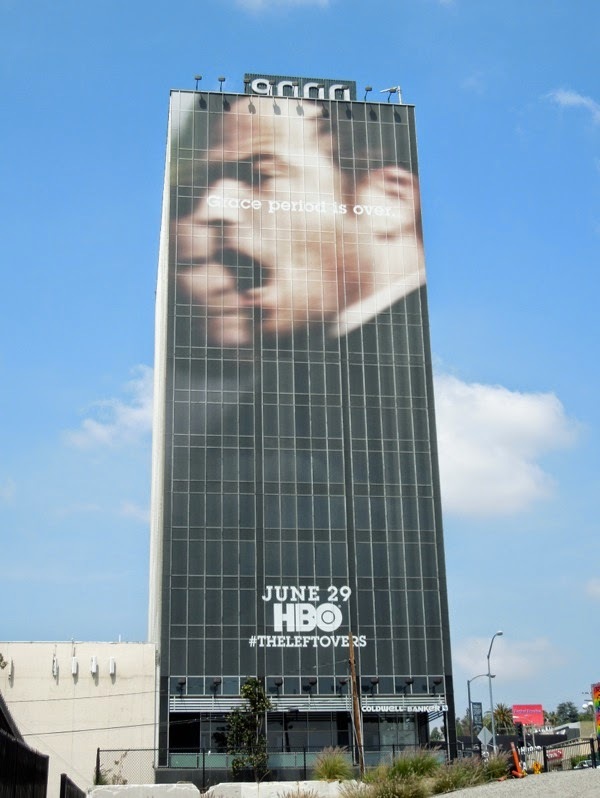 Justin Theroux doesn't look too happy in these billboards for the new show as a chief of police in a small traumatised New York suburban community left behind after an event thought to be 'The Rapture', which makes about 2% of the world's population mysteriously vanish, including around 100 of their friends, family and neighbours. 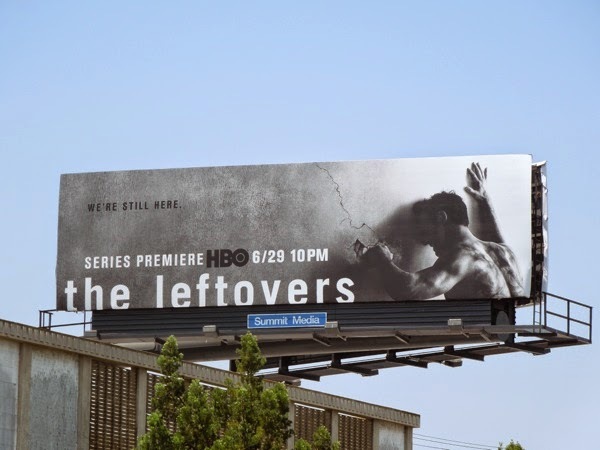 LOST's Damon Lindelof works with the author to bring Tom Perrotta's best-selling novel, The Leftovers, to TV audiences and delves into the aftermath of a world where nothing is the same since it happened, not marriages, not families, not friendships, or any relationships. 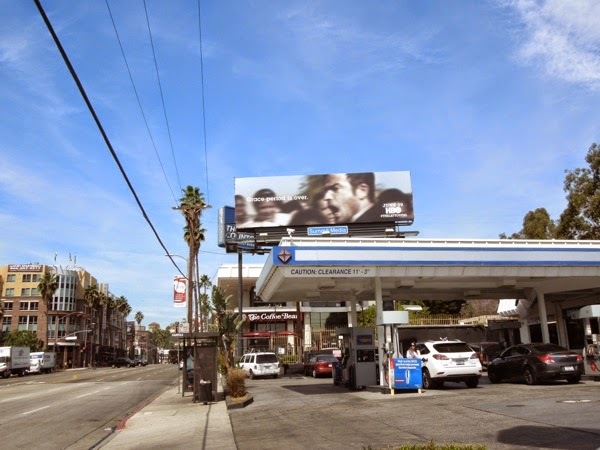 The show's premise sounds like compelling stuff with the exploration of religion, cults and personal crises, and these unconventional ad creatives certainly convey that this show will be different from what you may have seen before, and help them to stand out more. 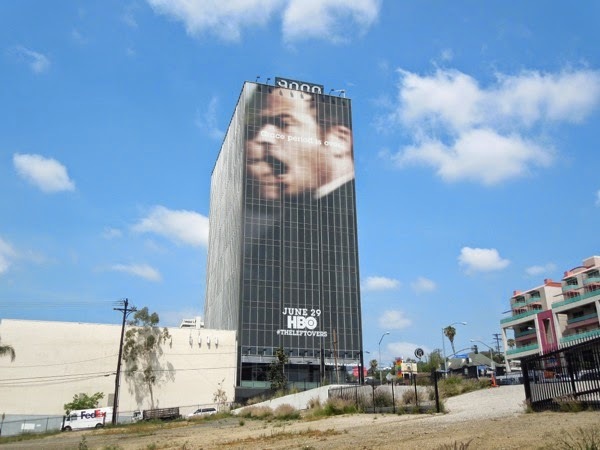 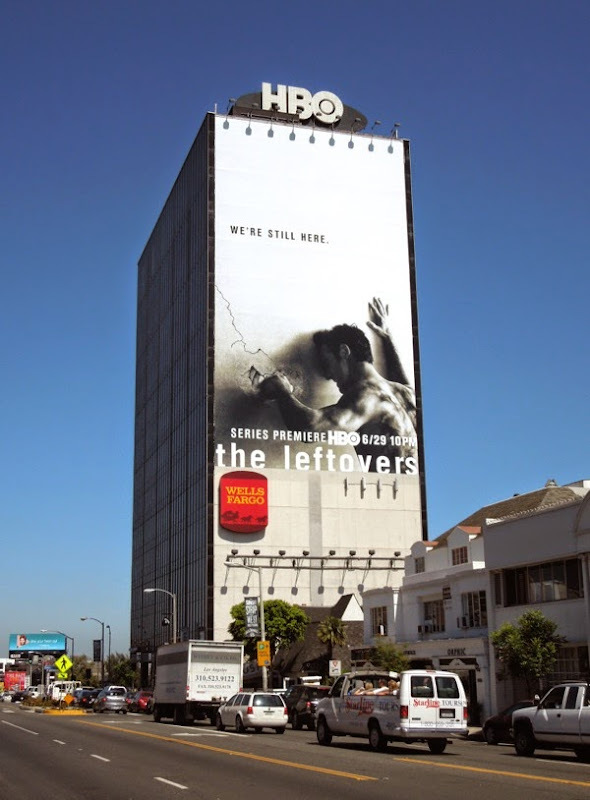 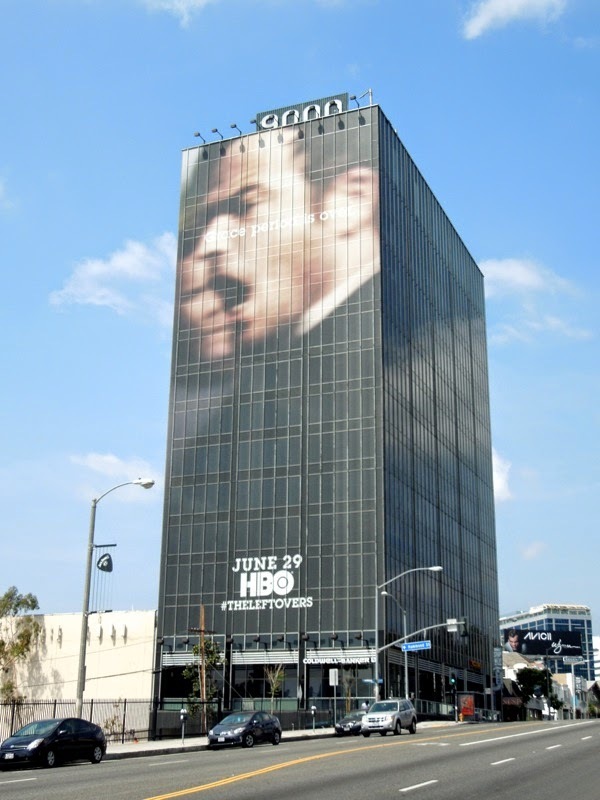 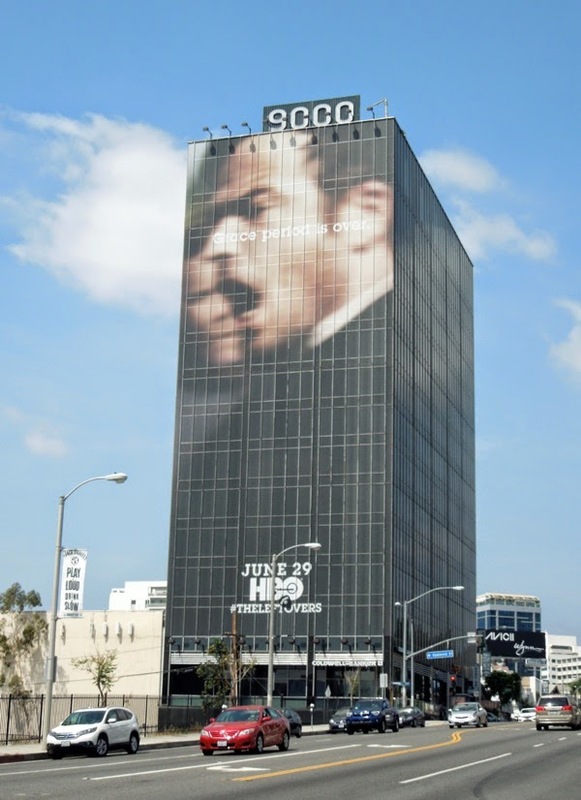 The giant-sized billboard announcing The Leftovers series premiere was snapped dominating the Sunset Strip skyline on May 8, whilst the landscape version was first spied along Sunset Boulevard on April 30, 2014. 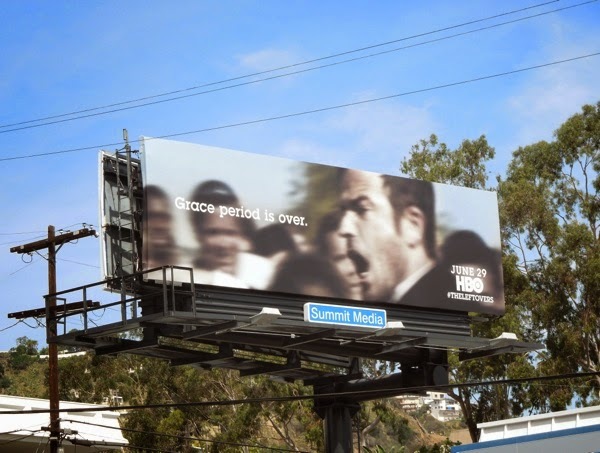 'Grace period is over', but Daily Billboard can't help but think what come next is even more heavenly in terms of televisual viewing. 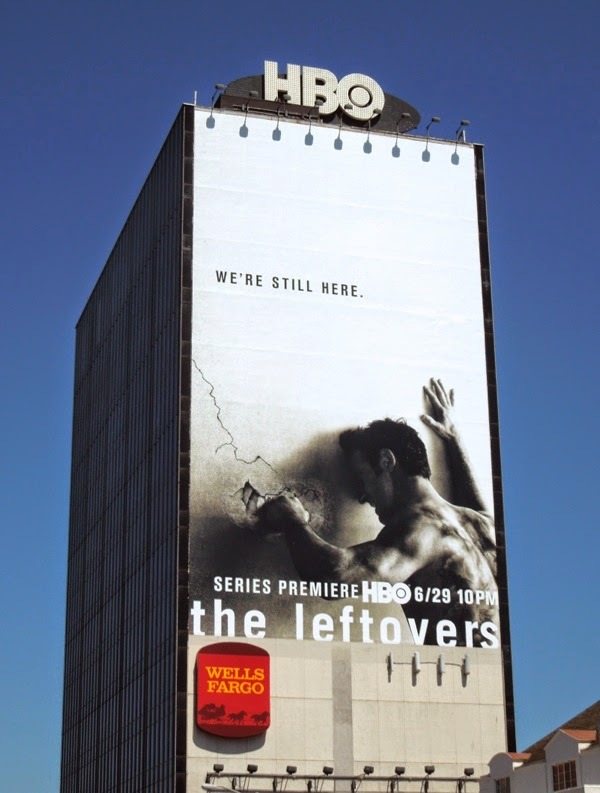 UPDATED: After being teased with the 'Grace period is over' ad creatives for The Leftovers, here's the angst-ridden series premiere billboard for the show pronouncing 'We're still here', spied along Pico Boulevard and La Cienega Boulevard on May 25, 2014. 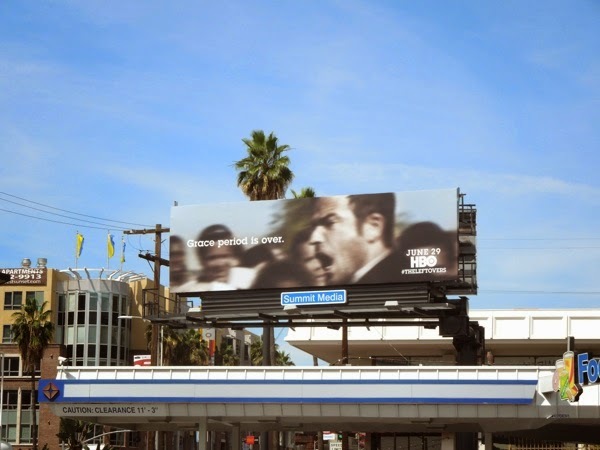 Daily Billboard loves the raw emotion conveyed in these ad creatives, especially this one with Justin Theroux taking his frustration out by punching a wall, and they don't feel as staged as other conventional series premiere billboards. 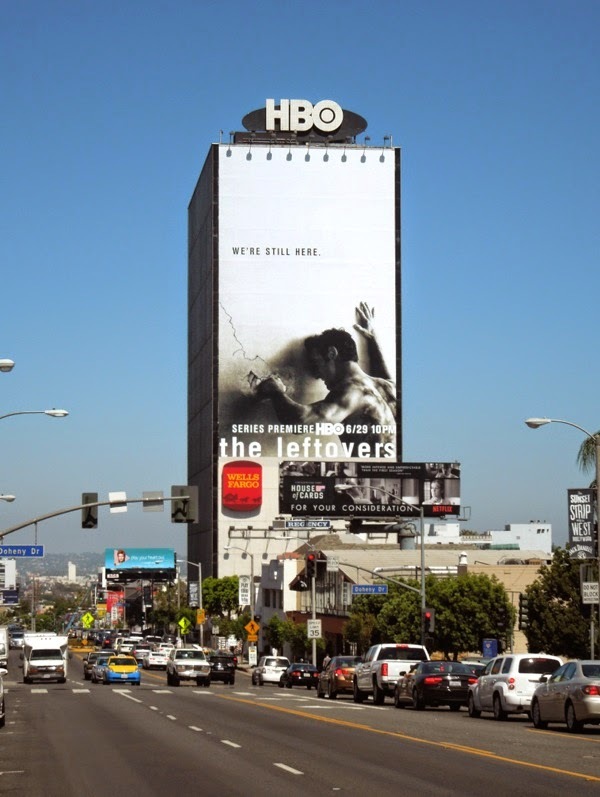 In addition to the landscape creatives this giant-sized portrait billboard for The Leftovers has appeared towering over West Hollywood's Sunset Strip. 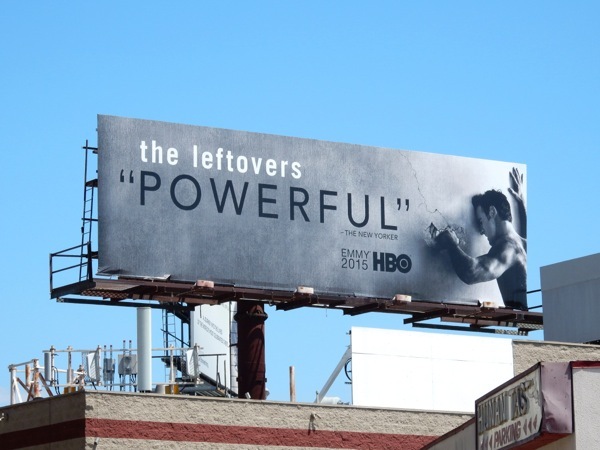 Snapped on May 30, 2014, it's such a compelling visual and the tagline stands out even more on that white background. 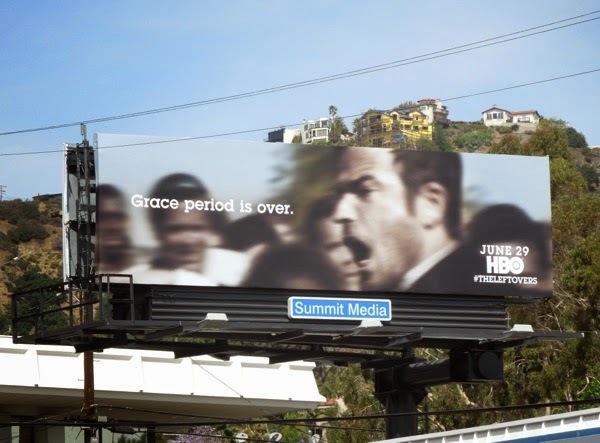 Let's just hope the HBO show lives up to the dramatic billboards. 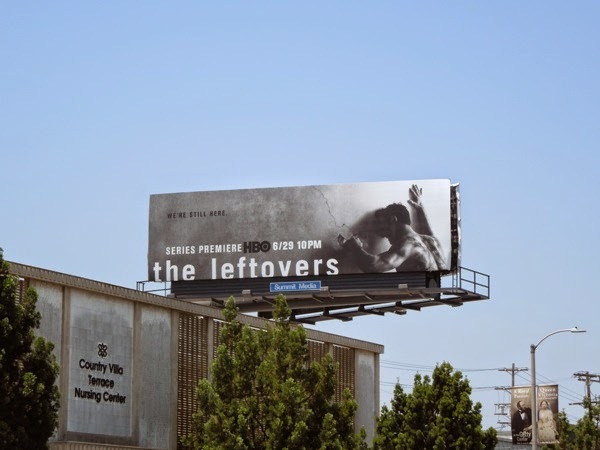 UPDATED: Here's an updated first season ad creative for The Leftovers Emmy Award consideration campaign, spotted along Olympic Boulevard on May 20 and along Westwood Boulevard on May 30, 2015. 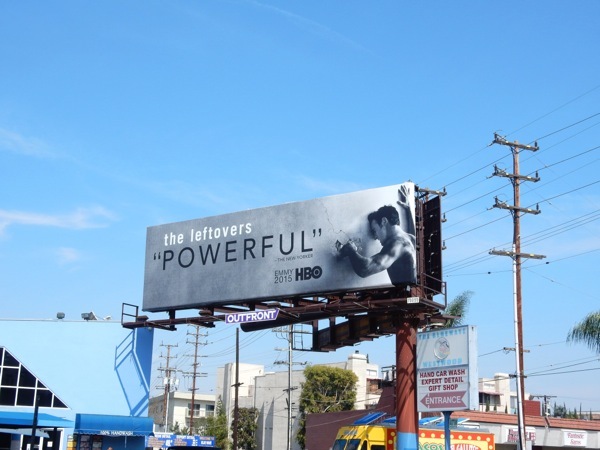 These "Powerful" billboards are part of HBO's annual cohesive Emmy Consideration outdoor ad campaign currently filling the L.A. skyline, so be sure to enjoy them all.